Ok, I think the times are over when you had to explain why quinoa is just an awesome grain. So let’s just assume you guys and gals know why. If not – read here for a whole list of awesome advantages. For those of you who already have been in love with quinoa for a while, you know how yummy, healthy, quick and versatile this grain is in our daily cooking. So why not give it a twist, instead of always using it the same way? As usually I get inspired by looking in my fridge with a hungry belly. Recently I had half of a sweet potatoe left over in the fridge. I normally love them steamed with coconut oil (another really healthy and yummy thing) but this time I wanted more than just veg. So I decided to make a quick, warm quinoa salad and give it an oriental twist. I just read an article on the great benefits of onions and garlic (great against inflammations and for your immune system) so I also roasted them together with the sweet potato cubes, some ground cumin and freshly grated ginger (also both great immune boosters!). In addition I chopped up a cucumber, 2 tomatoes, fresh chives and mixed everything with currants and almond slivers (this is why the salad gets a nice crunchy texture). Then mix everything with cooked quinoa (I like the red and white mix), add the juice of a lemon, salt, pepper and a generous amount of curry powder. It gives a great blend of flavors – totally different to the ordinary quinoa dishes I had before and can be enjoyed warm as well as cold. If you like, you can also add some cheese. I used a bit of Gbejniet , the maltese special cheese, but also feta would go well. For a vegan version just skip it. This salad would also go lovely as a side with some grilled chicken or a BBQ. Summer time is BBQ time and if you’re lucky like us you have a lovely circle of friends who all love food and whenever we get together it’s a big feast with plenty of stuff as we’re always scared we don’t have enough 😉 It’s always fun, pleasure and joy.. the only thing which often happens and I really don’t like it is that we often have plenty of left overs and I just hate to throw away food. It hurts me, especially knowing how much food is thrown away in times of huge hunger crisis in the world where people are not as well off as we are. That’s why I always try to make something out of left overs. Like yesterday when we had plenty of lovely Austrian sausages, grilled marrows and peppers as well as corn on the cob which hasn’t been eaten. So what to do with it? After a long weekend of beaching, drinking and BBQs I was dying for a lazy evening at home tonight and I felt like something healthy. On the other side what to do with all that stuff? 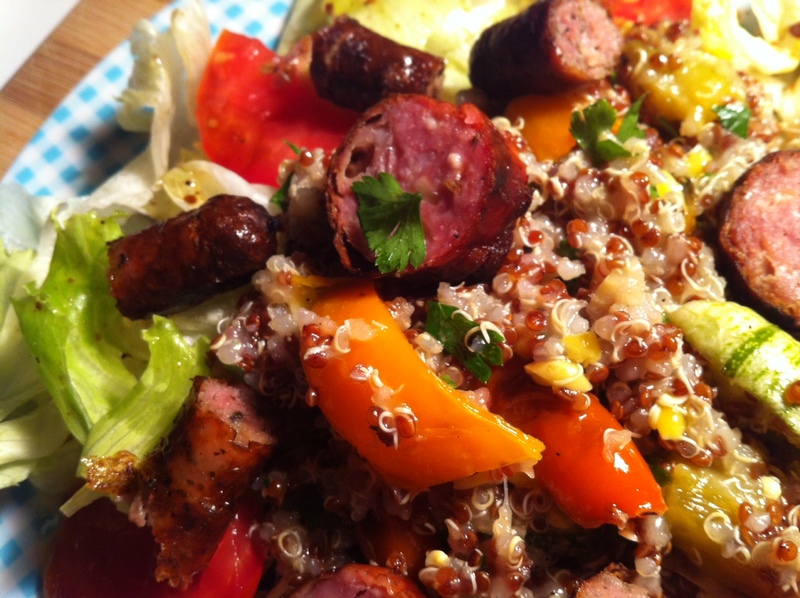 So I came up with a compromise solution: why not make a yummy salad with quinoa and some fresh greens as well as using my grilled veggies, the corn and small pieces of grilled sausages? Well, that’s the result and I must say it came out really nice 😀 I call it the All in one BBQ salad. sadly but truly summer is coming to an end… nevertheless it’s still warm and humid and the veggies super tasty & delicious! at least the changing weather brings me back on the sofa for some blogging again… so have a look and click on each pic to get more details on the corresponding dish!